Without much fanfare Adobe has posted the Lightroom CC & Lightroom 6 Manual. This is the latest version of the manual. And with a publish date of 4/20, is there a little inside joke here? The PDF manual is now two weeks old and the world should know it’s available, especially since it’s not included with the CC download. (However it is available through the Lightroom Help menu, which brings you to the official Adobe Lightroom Help web page. Most bloggers just post the Keyboard shortcuts as a download. This PDF download includes the keyboard shortcuts at the end in chapter 17, so you might as well get the whole shebang while you’re at it. What’s New details the facial recognition, panorama merge and HDR features along with a few other items like touch support for devices like the Microsoft Surface Pro. There is one thing that doesn’t get a mention that I’d like to know about, and that’s the animated circular icon that appears momentarily to the left of the Toolbar Content pulldown menu in the Develop module. What is this progress circle telling us? 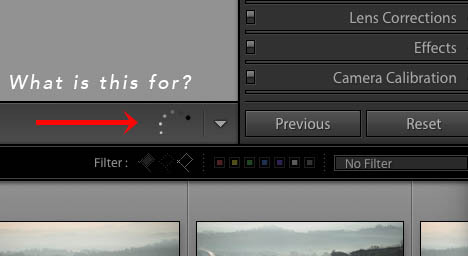 It happens so quickly on my machine that I had to illustrate what it looks like in Photoshop. I think it’s loading the develop settings, but I haven’t found the official Adobe description. Chapter 2 leads in with Lightroom Mobile. Sorry, it still doesn’t work for my workflow, but I know travel shooters that like it. Anyway, it’s 18 pages of details on editing, cropping, presets and white balance. Looks like it’s getting better. However, there are third party apps like Mylio (free for up to 1000 photos, $50-250 for additional storage) that work standalone or with Lightroom that are supposed to be faster and more robust across multiple devices. If you want to know more about Mylio, there’s a Kindle book co-written by Mylio founder David Vaskevitch – The Official Guide to Mylio: Mastering The Next Generation Photo Management System and a “Look Inside!” Amazon preview of the book that details the features. As I had mentioned in one of my earlier posts, this manual also has the same warning at the beginning of Chapter 3, Workflows: “Important: When importing for the first time, think through how you want to organize your photos and where you plan to store them before you start to import. Planning ahead can help minimize the need to move photos later and possibly lose track of them in your catalog.” True. So true. This is actually how I became Lightroom Guy, rescuing new users from the nightmare of lost photos in multiple catalogs. ‘Nuf said. From Chapter 3 on, the manual is a bible of detailed, but sometimes cryptic information (especially for new users) on how to use Lightroom. And because managing the Lightroom catalog is the most important part of keeping organized, I recommend reading Chapter 7 before reading anything else in the manual. Without a doubt, Chapter 7 should have absolutely been the first chapter! Becoming proficient in managing catalogs and files is critical to a happy life with Lightroom. Screw up the library and life can become a misery of lost photos and missing folders. If that’s where you are now, call me. I’ve downloaded a copy of this Lightroom CC manual and keep it on my iPad and workstation for reference when I need to know something. It’s easier to search and I don’t have to be online, which happens all too frequently with Time Warner Cable.